Every Sunday 7-10 pm, in a home somewhere around Seattle. Call 425-998-6134 for the location. Just a bunch of folks who enjoy getting together to sing – no particular expertise required. 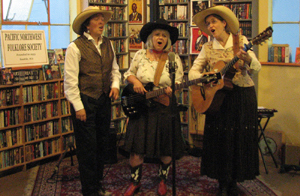 We sing mainly folksongs, but you may hear almost anything at one time or another. 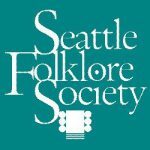 We have no dues or other memberships requirements, though we are associated with the Seattle Folklore Society. 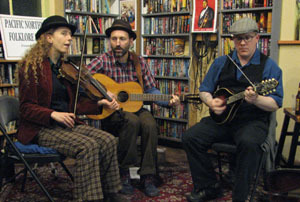 Gather & Sing at Dusty Strings! Come as you are, no instruments necessary! 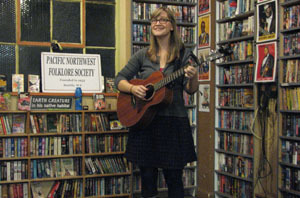 All levels welcome to this weekly tradition led by Seattle songwriter Alice Howe, who also provides accompaniment. Bring your favorite songs. Rob will happily call out the chords! He’ll pace this bluegrass jam according to the abilities and wishes of the participants. The name means what it says: play your music as best you can, in a no-pressure setting. After all, who better to provide a friendly and understanding environment for a guitar player…than other guitar players? You’ll take turns going around the room playing whatever you’re working on. It could be a piece you’re preparing for an upcoming lesson or a tricky passage you’re trying to work out. 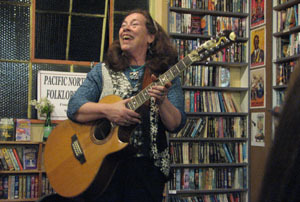 Debby leads all comers on a vocal journey to create spontaneous songs using rhythm, language and harmony. 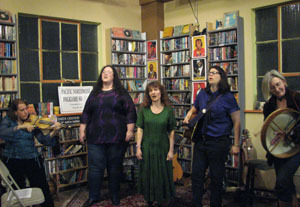 Mentored by Bobby McFerrin, Debby helps all voices find places to sing. Everyone is welcome. No experience needed. We’ll stick to simple tunes that the whole group can join in on. Singing is encouraged. Playing music is fun and playing the ukulele is the most fun of all. Let’s all jam together! 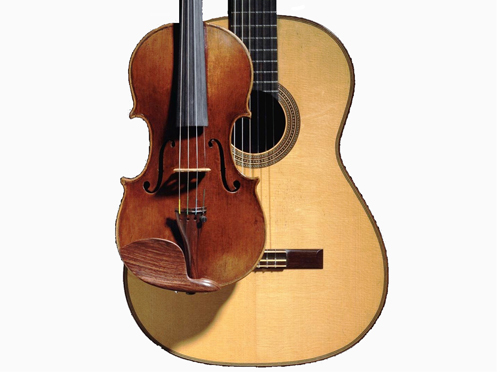 A new meet-up for players of any stringed instrument! Take turns playing whatever you’re working on in a friendly, supportive setting. Play a solo, ask the group to back you up while you play lead or sing, or share a song or riff you’re working on. Everyone participates as both performer and audience member. Bring your stringed instrument and come play! 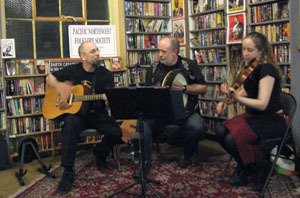 Music, Poems, Dance, Comedy, Stories! 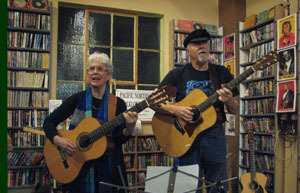 Play a few tunes, sing some songs, and join in community singing over a cup of coffee or tea and a lunch-time snack. A friendly intermediate-level open session. Whether you already know and love this style of Brazilian music or are just curious about it, bring your instrument or just come listen, have some coffee, home made food,beer or wine, and enjoy! Guitars, flutes, clarinets, violins, accordions, saxophones, ukulele, trombones and just about any kind of instrument can participate. We will have concert pitch and Bb lead sheets for those who read music. Sea Chanteys and other maritime music celebrate our connections to the sea, boats, and those who sail them. They include work songs and foc’sle ditties with great choruses that tie our present day maritime traditions and lore to those of the past. The call-and-response form makes these songs easy to learn and fun to sing for adults and children alike. Come and lead a song of the sea or just join in on the chorus. 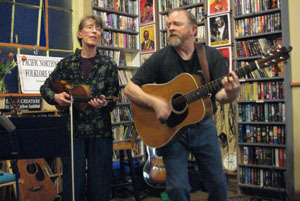 The Seattle Pub Sing aims to unite lovers of British and American traditional folk song for a relaxed evening of singing. 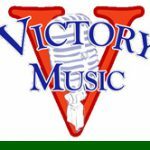 Victory Music hosts open mics every week. 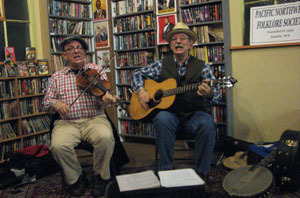 You’ll find our friendly volunteers and acoustic music from fledgling to fantastic at each event. 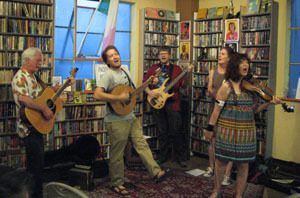 While each of our Open Mics develops a unique personality, they all strive to create a supportive, listening atmosphere for both musician and listener. 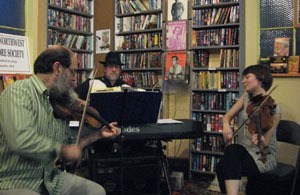 Klezmer is “music of uncontrollable joy fused with irrevocable pathos. Echoing the sounds of its long-lost homeland of Eastern Europe, it mirrors and interweaves with the musical kaleidoscope of its new home in America.” Klezmer music in Seattle includes: KlezKids, at Temple Beth Am, which welcomes instrumentalists of all ages and stages who can read sheet music; and Klez Chaos, “a self-selecting amorphous group of people who like to play klezmer tunes for fun in their spare time,” they meet in the Greenwood district every 3rd Wed.